The year 1972 is an interesting example for withdrawal strategies. It was followed by a crash in 1973 and one of the longest bear markets in US history. But by the 1980s things had recovered. In fact, they had more than recovered. This is classic “mean reversion” in action. If you had used a variable withdrawal scheme like VPW, your withdrawals would have looked like this. The withdrawal amounts are adjusted for inflation. 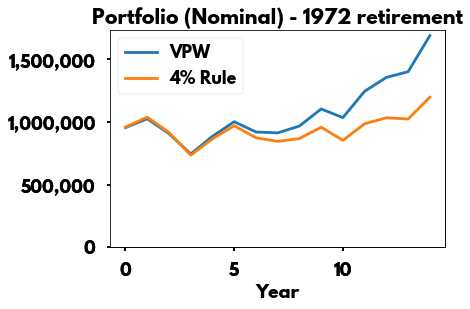 VPW cuts withdrawals and they stay low for 15 years. That’s a long time. In fact, there’s a good chance that you’ll die before the withdrawals go back to “normal”. 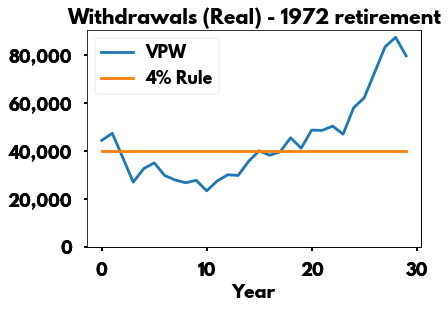 Sure, in years 20–30 VPW sees the withdrawal amount climb substantially. But are you still alive then? Are you able to take advantage of all that extra money? 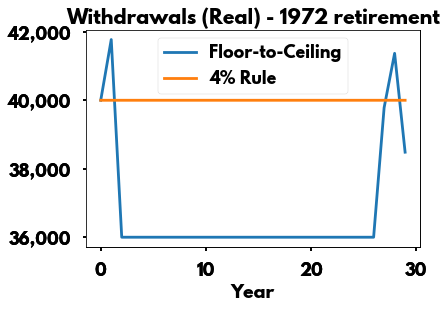 When you look at the bigger picture, the 4% Rule doesn’t appear to be taking any massive risks either. The portfolio, when looked at in nominal terms — which is how most people think about their portfolios at the end of the day — isn’t exactly being reduced to $0. However, when you look at what percent of the current portfolio is being withdrawn each year, you wonder if any real retiree would have been able to follow through with the strategy. Notice that the withdrawals are over 8% of the portfolio for much of the entire retirement. And at points over 10%. Would you take out 10% of your portfolio when you were aged 75? I suppose that would really test your faith in mean reversion. 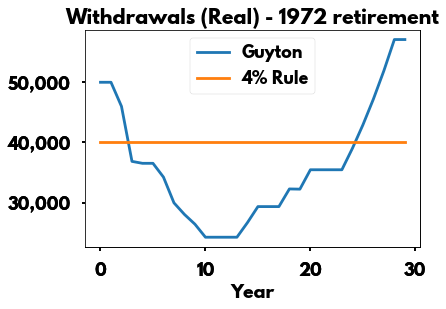 While we might not be willing to totally ignore market gyrations, as the 4% Rule does, it seems clear that ignoring them to some extent would help our retirement — especially the early part — quite a bit. At least in the 1972 scenario. Many withdrawal schemes introduce floors, guardrails, and other adjustments to try to limit the pain of sudden dropdowns. Here are a few different varieties. None of them really solve this problem. They all cut withdrawals substantially for many years. In this scenario they all do noticeably worse than the 4% Rule. Admittedly we’ve cherry picked a scenario where the market really did “mean revert” and someone who ignored the market gyrations came out ahead. At the time, there were no guarantees that would happen. 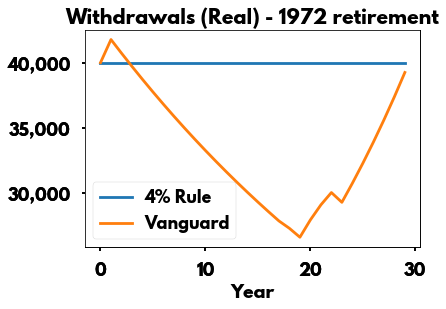 If the market stays down, or doesn’t recover as quickly, eventually the 4% Rule will run out of money. But I think that most people do believe in market reversion, at least to some extent. They believe that when things get beaten down then they will recover — to some extent. No one really believes the market will crash 40% and stay there forever. One way of rephrasing that is that people believe current valuations offer some indication of future expected returns. When the market has crashed, valuations are very low, and people expect future returns to be high. The opposite is also true, when valuations are high, people expect the market to crash soon, and expect future returns to be low; but let’s focus on the first case for now. 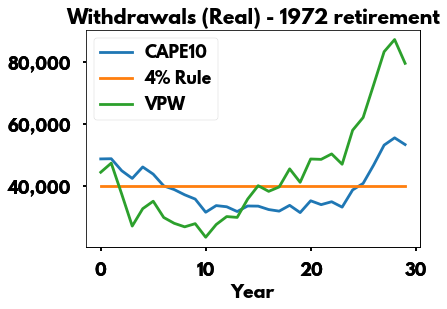 One popular way to think about valuations now is by looking at CAPE10. These are the CAPE10 numbers for the first several years of 1972 retirement. But how do we determine what “withdraw a bit more” actually means in real life? Without winging it and just making up a number? One way we can use CAPE10 is to plug it into the PMT formula and use that for variable withdrawals. We can’t use CAPE10 directly but if we take the inverse, 1/CAPE10, and treat that as our “expected future returns” we can put that into the PMT formula. So in 1973, when CAPE10 was 13.49 we would put 7.4% instead the PMT formula. But in 1974, when CAPE10 had dropped to 8.29, we would put 12% into the PMT formula. This is a textbook example of using CAPE10 in a PMT calculation counterbalancing a portfolio drop. Instead of withdrawing $57,977 we withdraw $84,832. The portfolio dropped due to the crash, so we withdraw less. But future returns are higher, due to the crash, so we withdraw more. So let’s pull it all together and run a full simulation for a 1972 retiree. It is clearly far from perfect. You still spend many, many years withdrawing less than the 4% Rule have you doing. In the first half, it is an improvement over a plain PMT calculation like VPW. The drawdown in withdrawals is less — and less steep. The second half is less clear whether it is an improvement. It takes longer to increase withdrawals. And withdrawals never reach the stratospheric levels of VPW. On the whole, though, it is probably an improvement. Most of the gains come in the first 15 years of retirement when we’re more likely to be alive and active. As humans we tend to care more about downside than upside, so missing out on the big upside of high withdrawals at age 90 isn’t a big negative. This is already quite long, so I’ll wrap it up for now. Where are we? Using valuations — via CAPE10 in a PMT calculations — appears, at first glance, to have some merit. So long as you’re willing to place a bet on mean reversion. 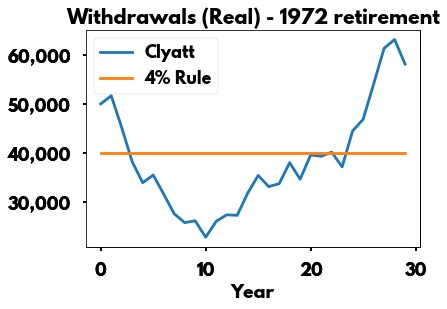 Note: “place a bet in mean reversion” doesn’t have to mean “have absolute faith in mean reversion”. The gains are not huge. This isn’t a panacea that will help you sail through a market crash. So set appropriate expectations. The merits are hard to determine with confidence just by looking at a chart. We probably need a metric (or two) with a more definitive conclusion before we can feel comfortable adopting this. Things look okay for 1972. But we definitely need to look at other scenarios. Are we making some things worse? Did we just “get lucky” in 1972?